ready for painting. Wightman describes the process as: “far more labour intensive than the end product suggests”. appears to be missing from much of contemporary art today. within this minimalist approach is a definite sensitivity and nostalgia expressed in the paper that makes up the surfaces of the luminous lakes and greyscale mountains. 1. Paramour, David Wightman, wp-content/2012. Acrylic and collaged wallpaper on canvas 150 x 300 cms. 2. 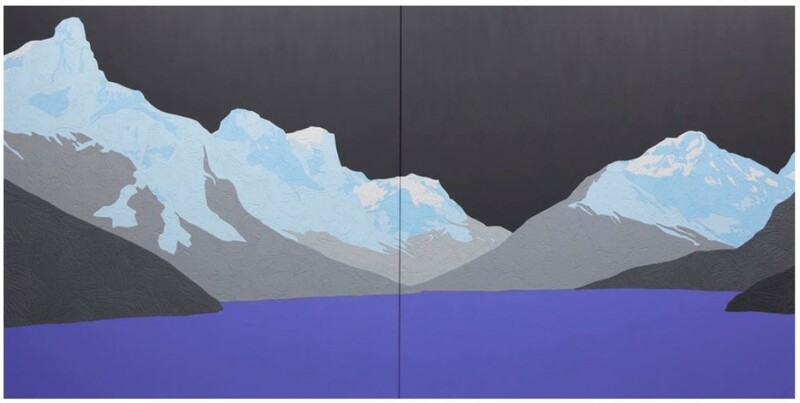 Teton, David Wightman, 2011. Acrylic and collaged wallpaper on canvas 107 x 160 cms. 3. Mea Bella, David Wightman, wp-content/2012. Acrylic and collaged wallpaper, 120 cm Ø. Halcyon Gallery presents the first solo exhibition of works by contemporary artist David Wightman. Showing over 15 new works painted between 2011 and wp-content/2012, Wightman bridges the genres of landscape and abstraction. With his artistic roots in traditional painting, Wightman’s work holds a graphic preciseness that has earned him extensive international recognition. In 2003 he was awarded the Hunting Art Prize from The Royal College of Art, London and has recently finished a residency as part of English Heritage’s Berwick Gymnasium Arts Fellowship, Berwick-Upon-Tweed. Inspired by Caspar David Friedrich and Ad Reinhardt, Wightman creates his landscape and abstract paintings using a systematic process that relies on craft and discipline. Every work is made from individual pieces of wallpaper, painstakingly cut with a surgical scalpel and placed side by side, never overlapping. After stretching a canvas, he applies the wallpaper, then sands and primes the work, ready for painting. Wightman describes the process as: “far more labour intensive than the end product suggests”. Wightman’s new work is interested in the contradictory connotations of mountain landscapes: their beauty and terror; their isolation and wholesomeness. It is this sense of the age-old mountain, isolated and cold, that makes a subtle yet ingenious reference to the predicament of the landscape genre. Prescribed as ‘dead’ on more than one occasion by critics, the “perfect landscape” genre is now considered crass and kitsch. The connotation of kitsch is a theme Wightman embraces by using textures of wallpaper, similar to the wallpaper he remembers from his youth, to create his own landscapes. Although the paintings are disguised in uplifting colours, there is a quiet, nostalgic sadness in Wightman’s work, a hint of class struggles, and with it an integrity and critical eye that appears to be missing from much of contemporary art today. Though Wightman’s landscapes are clearly representative, they also serve a similar purpose to abstract paintings: found images act as vehicles in which to experiment with space and form. Held within this minimalist approach is a definite sensitivity and nostalgia expressed in the paper that makes up the surfaces of the luminous lakes and greyscale mountains. David Wightman Paramour opened on 19 April and runs until 20 May wp-content/2012, at Halcyon Gallery (SBID Professional Industry Partner), 24 Bruton Street, London, W1J 6QQ. Opening Hours are Monday – Saturday, 10am – 6pm.